In the fishing world, an invisible competition is always present between baitcasting and spinning reels. While some dare to say that the versatility of spinning reels makes them more suitable for every kind of fishing than baitcasting ones, others state that there will never be a more powerful and professional reel than the baitcaster. Nevertheless, many anglers out there might not know the real difference between them, to begin with, preventing them from making the right choice when buying one according to their fishing style, their skills, and what they plan to achieve with it. The best spinning reels and the best baitcasting reels can only be bought if you know not just how to use but also the fundamental differences between them. 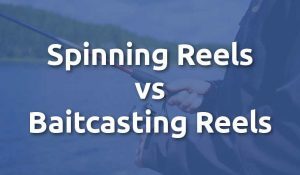 For this reason, we’ve compiled all the necessary information in one article where both baitcasting and spinning reels are explained in detail, as well as compared in a table below. With a bit of luck, this will help you choose whether you need to fully experience your fishing weekends in a baitcasting or a spinning reel. What should you use baitcasting reels for? Who should use baitcasting reels? What should you use spinning reels for? Who should use spinning reels? A baitcasting reel, also known as a revolving-spool reel, refers to the type of fishing reel that stores the line on a bearing-supported revolving spool. This specific part has been geared in a way so that one revolution of the hand crank means many revolutions of the spool. Baitcasting reels are commonly mounted over the rod which is why it is also called an overhead reel in a few countries such as Australia and New Zealand. It is a particular type as most fishing reels are suspended on the bottom of the rod; this also means that, for functionality, the crank handle usually is on the right side. Typical materials used for the baitcasting reel’s construction are aluminum, stainless steel, or even composite and synthetic resources. Likewise, they usually require lures of 1/4 oz. or more in weight so the angler can cast long distances. Among the external parts of a baitcasting reel, you’ll find the spool, the brakes, the level wind mechanism, the thumb bar that allows you to stop the line immediately, and of course, the handle of the spool. Among the internal parts, you should keep an eye on the main and pinion gears, the drag washers, and the ball bearings that determine how fast a line can be retrieved by a specific baitcasting reel model. Baitcasting reels are perfect for casting very long distances thanks to its spool. The heavier the lure, the longer you’ll be able to cast so you should always keep your lure weight in mind. Similarly, this type of reel is usually used to catch bigger species of fish as the gear has more power and offers more control. It means that a baitcasting reel will offer what a spinning reel won’t when you’re fighting against a big fish that keeps pulling hard. Baitcasting reels are compatible with all kinds of fishing lines: braided, monofilament, fluorocarbon, you name it, so if you happen to use a variety of lines when fishing, one of these reels will be your best companion. Baitcasting reels are powerful tools that require certain mastery. It means this type of reel should be used by those who have been fishing for a while and who have already tried several types and models of fishing reels in order to know how a baitcaster behaves. Because baitcasting reels are harder to master than spinning reels, they are usually used by professional anglers or those who already have some expertise. Whoever is looking forward to fishing big species like salmon, bass, and pike, should get a baitcasting reel, without a doubt. More power. Because of the way the reel stands above the rod, the torque created when the crank is turned is straight and linear, meaning it is much more powerful than when the line is not direct. Perfect for fishing anything over 10 pounds. Spinning reels are also commonly called fixed spool reels, and they were first used over 100 years ago as a solution to the lure weight problem of the baitcast reel. Because some anglers wanted to use very light lures to catch certain species of fish, the spinning reel was created so that they could cast long, no matter what. This type of reel is normally mounted under the rod; this position allows your wrist to not make any effort to keep the spool in place, the contrary to what happens with baitcasting reels. Spinning reels were the first to introduce the handle on both sides of the rod, suiting right and left-handed anglers alike. Similarly, because these reels have no rotating spool that can overrun and foul the line, backlashes when casting are immensely reduced. These reels are typically used for smaller fish species as they are not as strong as baitcasting models. However, because of its design, which is meant to twist and untwist it on its own, it works best when used with very flexible fishing lines. The external parts of a spinning reel feature the spool, the pickup or bail, the handle for retrieving the line, the reel seat, an anti-reverse lever that most models come with, and the drag adjustment knob. Spinning reels are the most popular type of reels among fishing beginners because it requires no special skill and can be used by everyone. They are also great at catching smaller species so if you’ve only begun to fish; it’s best to get a spinning reel first and leave the baitcasting reel for later. Spinning or open face reels are specially designed to prevent backlashes and to use lighter lures. This is the ideal type of reel to fish small and medium-sized species so don’t consider it if you plan to get big fish. These are all-purpose reels that can be used for anything and in almost every situation, ocean fishing, ice fishing, etc. They are easy to use, require no expertise, and can normally retrieve the line very fast as they tend to be manufactured with high gear ratios. Lastly, spinning reels were first created with the intention of catching fish with lightweight lures such as small flies so you can rest assured that you can catch salmon and trout with all those weightless lures you can’t use on a spinning reel. Similarly, they are also useful for tackle bait. Spinning reels were initially designed to be more straightforward and backlash less than baitcasting reels. It makes them the perfect choice for anglers who have just entered the fishing world and still have a long road ahead. These reels don’t have any learning curve, so you don’t need to learn a specific technique before using it. It means that they can be used by professionals or beginners alike. Beginner-friendly. You don’t need to learn any tricks or techniques to use a spinning reel as it happens with baitcasting ones. They can be used by everyone, even those who’ve gone fishing for their first time! While spinning reels have proven to be more versatile, multi-functional, and beginner-friendly than baitcasting reels, the fact is that you’ll never be able to catch big fish with one of these as they are meant to fight only small and medium species. It doesn’t mean that a particular type of reel is better than the other but that you will have to look at your circumstances before making a choice. There is no correct answer to the baitcasting-spinning conundrum, and it will all come down to where you want to go fishing, how skilled you are, and which species you’ll try to fish. That being said, if you’ve only entered the fishing world and want to buy a reel that will help you get the hang of this activity, a spinning reel is undoubtedly the best choice. However, if you’ve mastered a casting technique and want to get a durable and reliable reel, a baitcaster is what you should aim for. Whichever you pick, make sure to get a high-quality model that will not only stand against the harsh fishing circumstances such as saltwater, but that will also let you feel comfortable and confident when fishing.